Hi, and welcome to my site!I'm Luigi Aldini and the red plane above is the Falco, the plane that I've built with the help of my two sons, Davide and Marco. 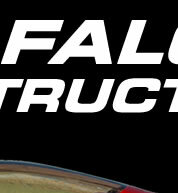 Why did i decide to build a falco? 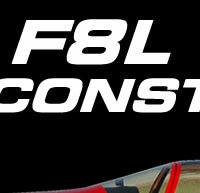 Well the Falco is a wonderful machine and it has always been a dream to me to own one. It was designed by Ing. Stelio Frati in 1955 and it is still a big success worldwide. The Falco is sold as a kit by Sequoia Aircraft Corp. I always wanted to build an airplane, and thought about building a small aerobatic biplane like the Pitts. 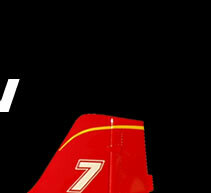 But one day Enzo Marrucci offered to sell me the factory jigs of the plane and.. I had no doubt about starting! The Falco is certainly an excellent performer ! I enjoyed it's construction since the very first moment. After having studied the drawings and prepared the workshop I decided to build all the wood and the metal parts based on the original drawings. In this site you'll find a construction section with many pictures and description about the work i've been doing to finish this aircraft. I hope that this section will be helpful to other builders and others! 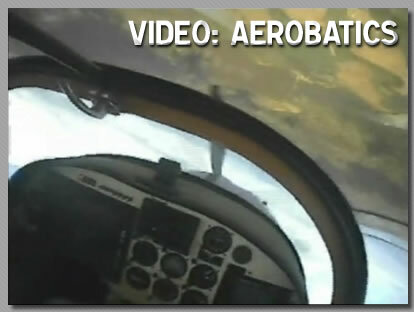 Now that the Falco is finished after 7 years of hard work, we like to enjoy it flying and we're very happy for that. It's a dream come true. So we decided to restore another aircraft.. the Fiat G46. 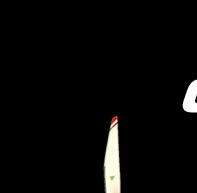 The Falco is a plane with a long and illustrious HISTORY! So you will find a section dedicated to the history of this marvellous plane. It's time to post a video. We made an aerobatic fight with a very small Sony helmet cam, that we borrowed from a friend, and I (Davide) fixed it on my headset. Hi to everybody! Finally a new update.. This time I've uploaded a gallery regarding the interiors of the falco. 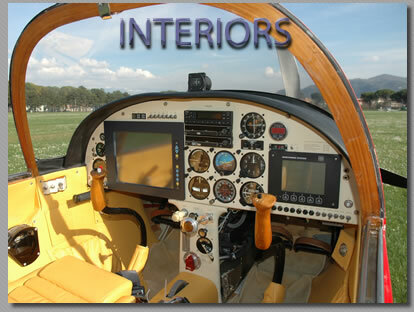 The interiors, including the seats and the cockpit were completly designed and made by us, and they are different from other falcos. We followed the old Ferrari style, including the yellow leather that we have used. I promise that I'll publish new updates soon and many many pictures, so come back to visit us again! 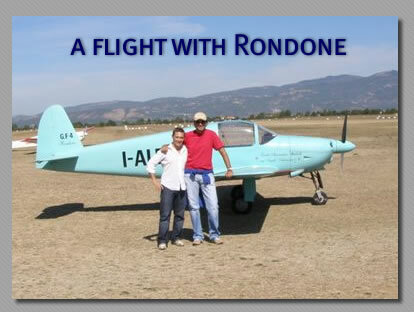 Paolo Marrucci, the son of Enzo (the friend who sold us all the jigs of the falco-it's all his fault..) and Davide go together for a flight on the Rondone I-ALBJ. The flight was really nice, and I-ALBJ is a fantastic aircraft. Ing. Frati designed it for Igino Guagnellini whe won many races and set several world records. Enzo restored this aircraft, repainted it with his original colour and he flies it regurarly toghether with his son Paolo with a lot of passion. 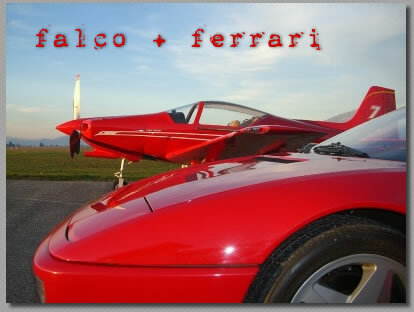 When a Falco meets a ferrari .. who's the red one? A nice meeting in Rieti with a beautiful Ferrari 348. Some pictures with the beautiful series 1 falco I-TRIP, owned by Antonello Budini Gattai. He' s one of the most expert falchisti and a friend. He came to Rieti some time ago and we made some pictures together. It's nice to see one of the first falcos to be produced together with one of the latest. 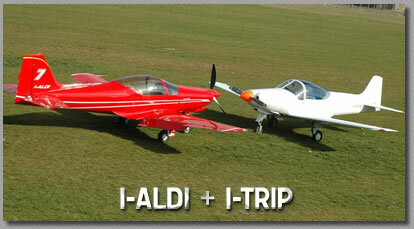 Antonello is a former Alitalia captain and owns a beautiful Agriturismo in Tuscany , with a nice airstrip. You can see it here . A new website layout.. After one year i decided to switch to a new style. I wanted to update to Web 2.0, also to allow easier and faster updating. Hope you like it ! Meanwhile we are enjoying flying the falco..